* Wide Wavelength range, satisfying requirements of various fields. * Fully automated design, realizing the simplest measurement & satisfying the requirement of pharmacopoeia. * Maximum of 9 Wavelength & 1 sample can be measured at one time. * Automatic change-over between T lamp & D2 lamp. * Optimized optics and large scale integrated circuits design, light source and receiver from world famous measurement methods all add up to high performance and reliability. 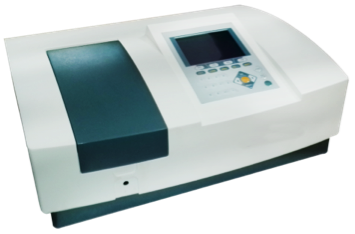 * Rich measurement methods: wavelength scan, time scan multi-wavelength determination, multi-order derivative determination, double-wavelength methods and triple-wavelength methods etc, meet difference measurement requirement. * Data Output can be obtained via a printer port and a USB interface. * Parameters and data can be saved for user's convenience. * PC controller measurement can be achieved for more accurate and flexible requirement. 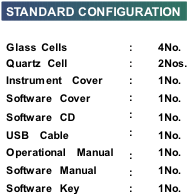 Standard Curve Up to 10 Standard sample may be used to establish a Curve. Four methods for fitting a curve through the calibration points : Linear fit. Linear fit through zero, Square fit and cubic fit.